Fabricare (July/ August 2017) – Let’s face it – the dry-cleaning industry has taken a hit in today’s modern working world. According to recent statistics from IBISWorld, dry cleaners are currently experiencing a marked decline in revenue and traffic. More people are working from home and more employers are relaxing dress codes at the office – meaning less people are taking suits, shirts, dresses and slacks to the dry cleaner each week. Of course, for most dry cleaners, this isn’t news, but some strategic dry-cleaning business owners are beginning to fight back. They’ve realized that it’s more imperative than ever to establish credibility and brand awareness with new movers as soon as they get to town so they DO know where to turn when they need a dry cleaner. Their solution? Targeted, category-exclusive New Mover Marketing campaigns that help them gain a critical competitive edge over other dry cleaners in their communities. Why Is New Mover Marketing Powerful? Businesses spanning a wide variety of industries have discovered that direct marketing programs that target new movers are outperforming other tech-based marketing programs, such as eMarketing and mobile offers. Even in today’s increasingly technological world, timing is everything and nothing is more powerful than reaching new movers first as soon as they come to town. New movers are actively searching for replacements to their old “go-to” grocery store, dental practice, and yes, dry-cleaner, as soon as they get to town. The business owners who reach these impressionable new movers first with valuable offers delivered directly to their mailbox are the ones who are top of mind in times of need. 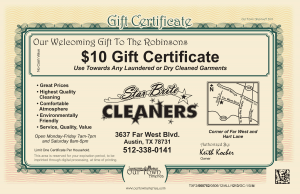 From a dry-cleaning perspective, take the example of Keith Kocher, owner of Star Brite Cleaners in Austin, TX, who says his New Mover Marketing program generates a 10:1 or better ROI per month. Numbers/results like that outpace the average ROI of marketing efforts like email, social media and newspaper advertisements. One of the biggest reasons New Mover Marketing has proven to be so powerful in recent years is the uptick in US migration. The US Census Bureau recently stated that migration rates in 2015 approached pre-recession levels, indicating a nearly-recovered housing market following the great recession. Also, just over 35 million Americans moved in 2016, which translates to several million businesses losing and acquiring customers. With so many people on the move, it’s clear that businesses who deliver a compelling offer to new movers as soon as they get to town have a higher chance of converting them into loyal customers. Consider that, according to Data Mentors, new movers will spend about $9,000 on their new moves, and they will look for new vendors of goods and services in the first six months surrounding their move-in. Additionally, these new families will be four to eight times more likely than established residents to respond to offers form local businesses. 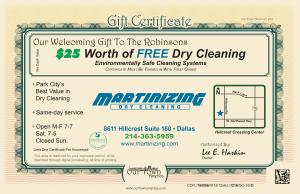 The bottom line for dry cleaners? It is crucial that you connect with new residents before your competition does. The dry-cleaning industry is not seeing the growth it once experienced. This is due to several concurrent trends, including a relaxation of workplace dress codes, the proliferation of low-maintenance fabrics and the increase in people working from home. Dry cleaners are also seeing more competition than before, from services like self-service laundromats, laundry valet services and household laundry appliances. Because the customer pool is shrinking for dry cleaning businesses, it’s more important than ever to take advantage of effective marketing programs like New Mover Marketing. Here are three examples of dry-cleaning business owners who have used New Mover Marketing to help their business thrive despite today’s industry challenges. Each of these owners have been working with our team at Our Town America for years to battle back against “dressed-down” working world and cultivate long-term, loyal relationships with new movers who still do need dry-cleaning services. four different dry cleaners on the same block, Keith Kocher has been offering new movers a $10 gift certificate on any purchase for more than 10 years. Kocher says he sees an average of 10-12 new movers redeeming their $10 gift certificate each month. He believes he receives a 10:1 ROI or better every month as each new customer spends an average of $100 per month. location in January 2007, Jeff Levine has stuck with New Mover Marketing because he knows he’s reaching a brand-new audience each month…and it’s working. 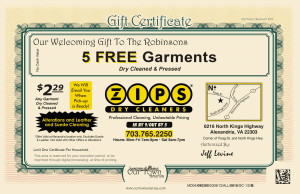 His new mover offer of five free dry-cleaning garments brings in a consistent stream of new customers each month and has helped his business grow 10% year over year in each of the last 10 years. offering new movers $40 worth of free dry-cleaning since June 2015. Haskin says the first customer he received from the New Mover Marketing program spent $400 in his first visit and has since become a loyal customer. Additionally, he says he typically sees five or more new customers per month redeeming their $40 new mover gift certificate in store. Consistently sending greetings and deals out to new movers by hand would be a Herculean task for any small business owner…and no owner has time for it. A New Mover Marketing partner, like Our Town America, already has vendor relationships, on-the-spot tracking infrastructure, graphic designers, and mailing lists in place, so businesses simply need to work with them to define their goals, specify their offer and select their targeted zip codes. Equipped with that information, your New Mover Marketing company will be able to accurately target new residents in your area with valuable welcome packages designed to introduce them to the services they need to feel at home following their move. Make your offer valuable. Customers know when deals aren’t worth the gas spent to drive to a business. Our recommendation? Give them the first experience on the house (i.e. $10 gift certificate or 5 free shirts). They’ll be back if you help ease their stress and make an excellent first impression! Follow up with the families that respond. A first visit is a great opportunity to begin building a long-term relationship, and turning a new neighbor into a loyal customer. Some New Mover Marketing partners, like Our Town America, even include a second follow-up mailer to help facilitate that relationship. You also can suggest your Facebook page to new customers or invite them to join your in-house mailing list as well. Track the success of the program. If your marketing partner doesn’t offer real, hard metrics, it’s time to find a new one. Keep tabs on the number of offers/certificates redeemed at your location each month so you can evaluate performance! The Dry-cleaning industry is facing difficult challenges in today’s working world, so memorable marketing programs are more important than ever. With New Mover Marketing, any dry cleaner can reach the right people at the right time to ensure they are top of mind when local customers DO need their services. So, the question becomes, which dry cleaner in your market will earn the hearts and minds of new movers first? To become an Our Town America sponsor, please complete a Contact Form, or sign up online with our New Movers on Demand portal! You may also give us a call at 800-497-8360 and mention the 'Fabricare article'.